Assess the size and shape of both horse and rider to find a fit that works. You Love Your Horse. We do, too. Our focus from the beginning is in pairing the right saddle with both horse and rider. Whether you are brand new to this or a veteran shopper, we've got something to help you navigate the sea of saddles. A Comprehensive New Search and Notify Feature. 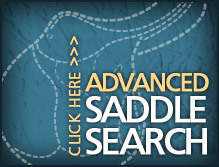 With our powerful saddle search engine you can enter specifications as exacting as you wish in order to quickly browse what we have in stock that might meet your needs. If we don't have what you are looking for right now, not to worry! We get new saddles in on a regular basis. If you create a free account and log in first, you can save these searches and receive email notifications whenever we list a match. From within your personalized control panel these searches can also be edited and deleted. You Can Now 'Virtually' Send us Your Horse! We are an authorized retailer of a special Impression Pad for checking saddle fit. 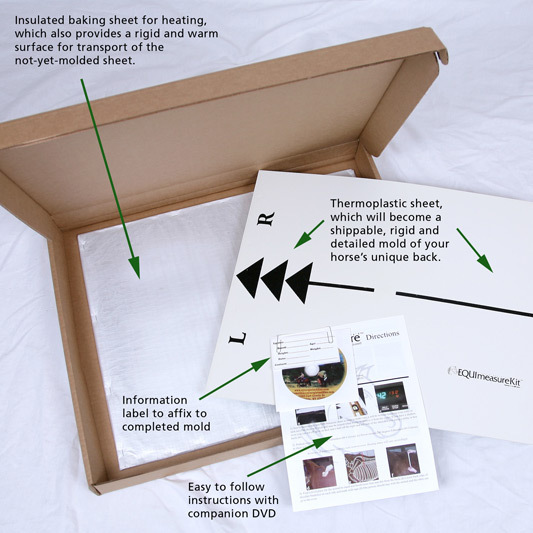 This pad can be used over and over and will allow you to visualize what is going on under your saddle in a way previously impossible without pressure sensing computer equipment costing thousands of dollars. Any high pressure areas are seen as a displacement of the material in the pad after a normal ride. This is a revolutionary tool, yet simple and affordable. Make sure your horse is standing on flat, firm, level ground and is squared up as much as possible. Please make sure to frame the whole horse in the picture from nose to tail to hooves. You want the horse to fill the frame as much as possible without cropping any of him or her out. 1.) A side profile view including the entire horse on each side. 2.) The horse's back viewed diagonally from above and behind. This is where a stool, mounting block, or other sturdy object will come in handy! While the mold-making kit is our first choice for finding a fit, we can still effectively help you rule saddles in or out for trial using wither tracings and photos. Due to the inherent imperfections and limitations of wither tracings, the intensive time it takes us to carefully evaluate them and the minimal room for error on all sides, we require they are done according to specific instructions. These very thorough steps are outlined in our wither tracings instructions page, here. Only tracings done on 8.5" x 11" or 8.5" x 14" paper with everything on one sheet will be accepted, with no splicing required. You will also need to fill out a rider questionnaire, here, to send with your tracings to help us make recommendations that will also be great possibilities for YOU. When these instructions are followed correctly you will be sending us the most accurate and thorough translation of your horse's shape that we know to be possible on paper. PLEASE NOTE: No long distance method is an absolutely 100% accurate way of fitting a saddle to your horse, but with the EQUIMeasure kit we can get extremely close! Wither tracings when done well have an estimated 75% success rate. We always want to help you find a match the first time around. However, trial and error are often just a part of the game when trying to make both horse and rider happy. 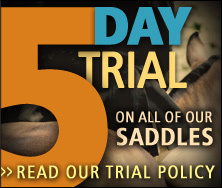 This is why every saddle comes with a 5-day trial by default.